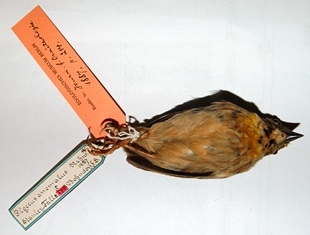 The Bob-tailed Weaver Brachycope anomala is in the monotypic genus Brachycope. The meaning of the genus is short - appearance, i.e. refering to the small size and very short tail of the species. The adult male has a black mask surrounded by some yellow on the head and breast. The female and non-breeding male are brownish with uniform buff underparts. The short tail and brownish plumage give the impression of juveniles, even in adult birds. 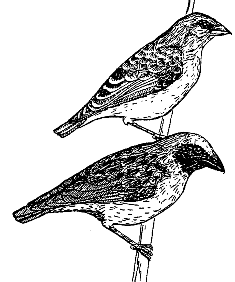 A pair (above, left), the first illustration of the species (from Bannerman DA. 1949. The Birds of Tropical West Africa, Vol. 7). This species was first collected at the Stanley Falls on the Congo River, by German collector F. Bohndorff in 1887. He collected a young male and this type specimen is in the Berlin Museum (above, right). No subspecies have been described for this species. 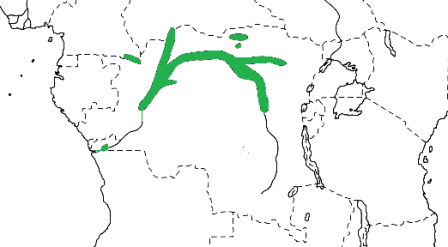 The distribution map (left) is based on Birds of Africa. The Bob-tailed Weaver is found in grassy clearings near large rivers in rain-forest. It has been recorded along the Congo River, and other rivers in DRC, Cameroon, Republic of the Congo and Central African Republic, with recent sightings from Angola. The Bob-tailed Weaver forages on the ground, probably feeding mainly on seeds and some insects. It uses clearings created for cultivation, and is often found near villages. The Bob-tailed Weaver is a solitary breeder and is probably monogamous. The nest is a sphere with a side entrance, woven of grass strips. The nest is placed in bushes, small trees and oil palms. The eggs are uniform dark grey, different to the colour of most weaver eggs, and not a common colour for bird eggs. A quick search of the internet and a weaver bibliography has not revealed any illustration of the nest of this species (though there must be one somewhere!). There are no PHOWN records for this species - be the first to submit one! Please submit any weaver nest records to PHOWN (PHOtos of Weaver Nests) via the Virtual Museum upload site.